Hello It was a pleasure to be involved with Children In Need. 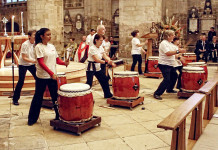 Milestone Taiko as always played excellently in the Cathedral, which looked stunning with all the lighting effects. A big Well Done to Milestone School who raised over £700.